Four members of the Decorah boys’ swim dove into the fierce state competition Saturday and returned home with a sense of accomplishment. Held in Iowa City, the team garnered 18 points in the team race to finish 22nd. With 226 points Ankeny was crowned the team champion while Waukee was the runner-up with 210. The 200-medley relay of Gus Grimstad, Jackson Penny, Bradyn Hook and Christian Johnson entered the final meet of the season seeded 24th. Filling the backstroke leg, Grimstad rolled into the wall in 24.70 to lead off the relay, Penny then glided through the water in the breaststroke in 29.32. Hook posted a butterfly leg of 25.40 before senior Christian Johnson anchored the quartet in the freestyle for a 24.03 split. The foursome finished in 1:43.45, good for 22nd place. The winning time was posted by the Dowling Catholic team in 1:32.67. Grimstad was in the water in two additional individual events. The sophomore entered the 100-yard butterfly event with the eighth-best time of 52.87. Saturday, Grimstad posted splits of 24.35 and 28.26 to place seventh in 52.61 seconds, breaking his own school record set a week ago. Winning the 100 butterfly event was Izaak Hajek in 49.45 seconds. Waiting until the third to last event of the day, Grimstad fielded a 53.76 seed time in the 100-yard backstroke, placing him with the ninth fastest time before the event. Saturday, the Viking had splits of 25.98 and 27.66, good for a time of 53.64 seconds. 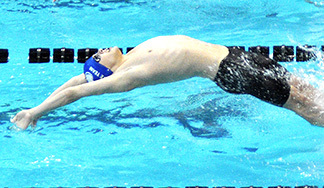 He finished 11th overall from a field of 24 swimmers. Dowling Catholic senior Nick Chase won the event in 50.10 seconds. The Vikes will have several key roles to fill next year with the graduation of six seniors — Nathaniel Cowie, Thomas Hendrickson, Christian Johnson, Andrew Mellick, Wesley Smith and Sawyer Vanden Brink.